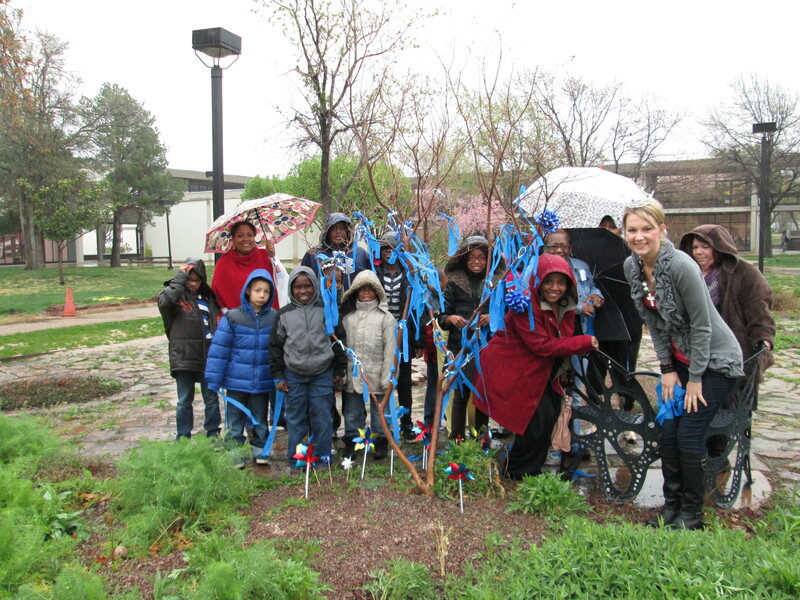 Despite the rainy weather, children from Willow Brook Elementary School and Miss Eastern Oklahoma County Teen 2013, Faith Suddath, placed pinwheels and ribbons in the RSC Butterfly Garden on April 2 for Child Abuse Awareness Month. “My platform is impacting children of the future by being able to be a part and volunteer for Willow Brook, and to get to mentor and read to the children,” Suddath said. RSC teamed up with Miss EOC Teen Faith Suddath to tie in her required platform requirement with Child Awareness Day. The blue ribbons placed by the ten children from Willow Brook were to signify abuse of children. “Children are gifts from God and they should be treated as such gifts, and no child should be mistreated,” Danita Ramsey, a special education teacher at Willow Brook Elementary, said. According to national child abuse statistics, a report of child abuse is made every ten seconds and as of 2010, more than five children die every day as a result of abuse. While walking around the Campus Mall, check out the blue ribbons and pinwheels placed in the tree on the east end of the Butterfly Garden.